TAB= Teaching Artistic Behavior, some call it "CHOICE" based art education. It's pretty prevalent in elementary schools, but rarer as you move up to higher grades. It often involves stations where students explore different media and themes at their own pace with many different projects happening at the same time, with the teacher as facilitator. Students clean up their own materials, record their daily work, and often end sessions by sharing their results with the class. A discussion I posed in the Facebook Art Teacher's group, and my own previous experience with my 12 choices project, has inspired me to add a bit more choice than I already do for certain units, like portraiture. I can easily make packets of many different ways I have approached the subject over my 25 years... blind portraits, gridded ones, traditional proportions approach, portraits with expressive color and pattern, linear ones where the hair tells a story about the person, and many more. Usually I choose one approach for all and they have to personalize it with their own choices of what to include to show off who they are, but by opening it to many approaches they can explore a bit more broadly, and I can still monitor without feeling overwhelmed. Explore Ian Sands Apex Art Choice Program Art of Apex H.S. I feel a bit uneasy about critics hailing it as "Great Art" when to me, I see it as a machine-like process of reproducing an image. It's starting to feel like a skill-based craft, similar to reproducing a nice chair, and rings "hollow" in expression. What is that artist's connection to van Gogh that inspired him to make a reproduction of "Starry Night"? Why Lego's? What does the material say about the work, and what does the work say about the man that made it... I would guess... nothing. If the artist conceives of and creates an expressive work of art via the "pixel process," I see it as justifiable, but sometimes lacking depth... much in the way I judge Kostabi, Koons, or other non-artist-"artists." (Grabbing attention but lacking depth.) It's like the "WOW" factor is more important than the art itself. One might say, "Well what about Chuck Close?" I have seen a retrospective of his work and he did do a lot of pixel-style work, even more pixelated than the grid portraits most people know about. (Example above is a Chuck Close Ink Stamp Drawing) I saw others done with thumbprints, blobs of paper paste, etc. But he broke down a photo without the use of a computer to tell him what tone to represent in a certain grid square. Much of the contemporary examples though are "popped" in a computer, photo-shopped, printed out, and followed like directions for latch-hook. When you think of a drip painting , Pollock can do it 'cause he came up with it, but others who do lose out on originality. Consider Rothko's color field work, and the many who came after adding little to the genre. Academically there is some value: color mixing, color theory in practice, and an exercise in non-traditional media that has some "wow" factor. One may argue too that it's an extension of Neo-Dada, the Pop Art of the new millennium. I think though, without a thoughtful connection of media to message however, it's a craft item, not far removed from latch-hook or paint by numbers, and maybe that's what critics said about Warhol in the 60's. One may argue that grid drawn portraits are the same but I'd argue the method is one we can trace back to the Renaissance, and it has been used through today by many artists in high regard. There is ample evidence that artists of the renaissance, had used a camera obscura to create images. We know some artists of that time used wire grids stretched on frames set between the subject and the artist. Though they may not have had printed photos, they certainly had close parallels. I am not willing to toss grid drawing just yet. Though gridding is a form of reproducing an image, it must be done by hand, and the student is still in a matter, drawing from observation, though it an observation of a printed resource. Instead of doing one large complicated drawing, students create 50 or so smaller, simpler drawings. Students are still thinking through the process, still learning to observe carefully. I try to make grid projects more "valid" by requiring students bring in images of a family member, or we take digital photos of each other, sometimes in costume, so it is "like" a commissioned work an artist of almost any time period would do. I have not yet done a pixel-based project with my students. I just have not yet found a way to add some "meat" to the pixel "bones." If one can tie the material to the message, and further connect it to the artist making it, I could see it being more "artful." Off the top of my head, a "hunger" based theme, created with food... or an obesity these paired with candy, Homelessness images created with coins... or to make that the "point" of the project--to illustrate with pixels an image that somehow related to the pixel material... That is the only way I can wrap my head around it and justify it, it's just difficult to remain connected to the student/artist. Drawing with 3 foot long pencils. I run an art camp for about 5 or 6 weeks every summer. I keep classes small and affordable so it does not feel like "work." These are kids that love art and are often self motivated. Those that come but obviously have no interest, are sent home with a refund. One of our most popular weeks is "CrAzY Art" week where we do things not allowed in a traditional setting, like making paintings by walking through paint and onto a canvas, setting fire to sticks and drawing with home-made charcoal, squirt gun paintings, painting with 3 foot paintbrushes... you get the idea. Someone posted a nifty idea of putting paint in a tight little lidded container with a bit of water and Alka-seltzer to make exploding paint. We're gonna try that! I saw an neat exhibition where an artist cut open stuffed animals, filled them with Quickcrete and later took off the skins. They looked like creepy Frankenstein-pets. We're gonna try that too. but this time we're going to try moon light silhouettes with tree branches, another project from the facebook group. We'll make some Andrew Goldsworthy style nature projects and photograph them. We'll make a sculpture head with cup up top to grow grass for hair, and a bunch of others. Projects that go well will make it into my public school classes, those that do not, will just be fun experiments. Summers can be a great time to experiment without an administrator forcing benchmarks or observations upon what you do. Every year I end camp (this my 20th year) I am always anxious to try out new projects when I return to school. For all of my 25 years of teaching art I have introduced my students to the great movements of art. Though vast and dizzying in it's array, I have chosen to start with the Renaissance, and end with Pop Art. So my full list would include the previously mentioned two plus Baroque, Rococo, Neoclassical, Romantic, Realism, Impressionism, Cubism, Expressionism, Abstract Expressionism, Dada, and Surrealism. Arguments can be made to add earlier art movements, and we do touch upon the ancient and modern styles, but these are the 13 movements I require my students to know. There is some "fudging" so for example, we consider "The Scream" an expressionistic work because of it's heightened emotional value, so too is Fauvism put under the same umbrella, and we lump Post-impressionism into Impressionism because it helps kids recognize the key features of bold brushwork, working from observation, and a hidden "Z" pattern within the paintings. My feeling is that after an introduction, later classes, like Art 2, 3, 4, or AP can partition movements a bit more precisely. I lose no sleep if a first year art student calls van Gogh an Impressionist; actually I rejoice! 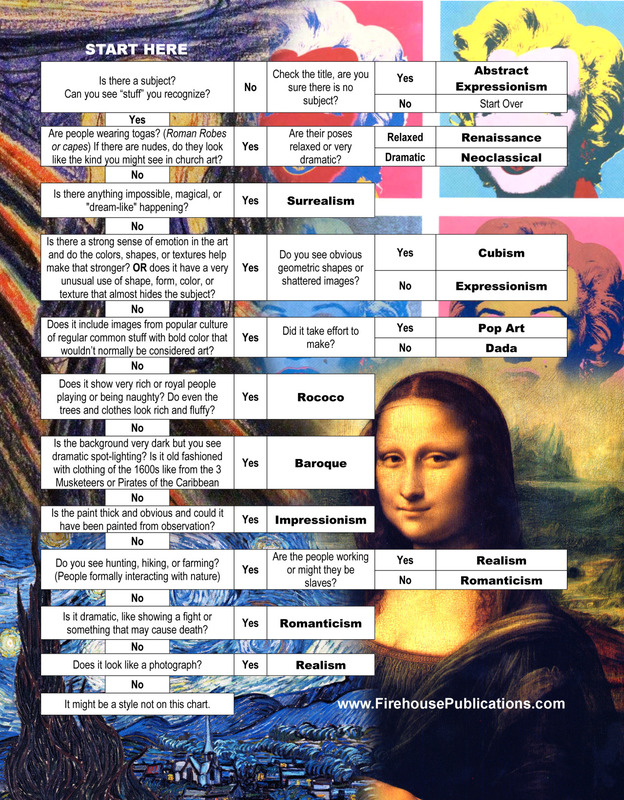 My final exam is one where students see 60 works of art, some they have seen before, some that are new, and they must use the visual clues to surmise the correct school of art. We play games, groups battle groups in a game-show-style contest to guess the art movement. They begin with a one page outline, and gradually move to no resource at all. Most do very well, but it has always been a challenge. I had an epiphany one day and made this flow chart. It's hardly complete, and only gives a bit of direction, but students found it very helpful. It won't work for pre-renaissance movements, and some off shoots like Northern-Renaissance, or Grant Wood's Regionalism, Grandma Moses folk works, or Whistler's Aesthetic Movement, but it does do an awful lot that is helpful. Kids spot how American Gothic is connected to the Neoclassical Movement with it's rigid composition, and morality message though with a more modern twist. How Whistler is connected to the Realist movement in his approach, and Moses too though in a "Country Craft" sort of way. I like how they argue within their groups citing visual evidence for their choices, pointing to brush work, the absence or presence of roman togas, the hues of the background. They are making astute visual observations, sharing them, and learning. It's the STEAM approach in full gear, a marriage of art and history. They love the little stories I tell about the work bringing it into context; how the Rococo artists were hated by the Neoclassical artists and it paralleled both the American and French Revolutions. How Cubism and Expressionism included shattered and distorted images, while European society and bodies of it's soldiers were shattered and distorted through World War One. How World War two saw the emergence of the atomic bomb that did not shatter bodies, but vaporized them--while the Abstract Expressionists, at the same time, like Pollock and Rothko, vaporized all subject matter! That the Baby Boom led to massive consumerism, so no wonder Pop Art blossomed. Though my list is incomplete, it becomes a good jumping off point. CLICK HERE for a printable version of the flowchart.